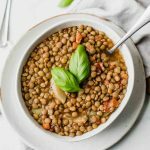 With 17g of protein, this Hearty Vegan Lentil Soup Recipe is perfect for an incredibly easy and healthy dinner! Made with wholesome lentils, fresh or frozen vegetables, diced tomatoes, and the best seasoning. You and your family will love this recipe! Eating healthy can be hard. Especially when you’re wanting to make recipes that your family will also love! To stay on track, it’s helpful to have several “go-to” healthy recipes that are not only good for you, but that are actually tasty, hearty, and something that the whole family will love. This Hearty Vegan Lentil Soup Recipe is here to save the day! Pro tip: Order these items through Amazon Prime Pantry and Amazon Fresh to save time and money! It’s AMAZING, guys. Get a free trial of Amazon Fresh HERE and a free trial of Prime Pantry HERE! Place the dry lentils in a large stock pot. For perfectly soft lentils, cook 1 cup of dry lentils with 3 cups of liquid. Bring the liquid and lentils to a boil and then reduce to a simmer. Continue to cook for about 30-40 minutes, until lentils are soft. For this vegan lentil soup recipe, the lentils are cooked along with the vegetables and seasoning all at once. There is no need to cook the lentils separately! 1. Freeze vegan lentil soup for easy dinners throughout the week! Make a big batch of this vegan lentil soup, place in freezer containers (These Rubbermaid Brilliance Containers are excellent! ), let cool in the refrigerator (without the lid), then add the lid and store in the refrigerator for up to 3 months! Fresh vegetables are always welcome, but frozen vegetables are a great option when you’re needing to save time! Looking to create more a of lentil stew? Using a little bit less broth will help achieve a thicker consistency. Adding more broth will create more of a lentil soup. Adjust as you see fit! P.S: It can be helpful to add a little bit of extra broth if you reheat this recipe! In a large saucepan or stock pot, bring the vegetable stock to a boil and add the lentils, chopped carrot, and chopped zucchini. Reduce to a simmer and add in the diced tomatoes, cumin, onion flakes, garlic powder, dried oregano, salt, and pepper. Cook for about 40-45 minutes. The broth - adjust the vegetable broth to adjust the thickness to desired consistency. Love how easy this lentil soup is. I made a big batch and it was perfect for my family!